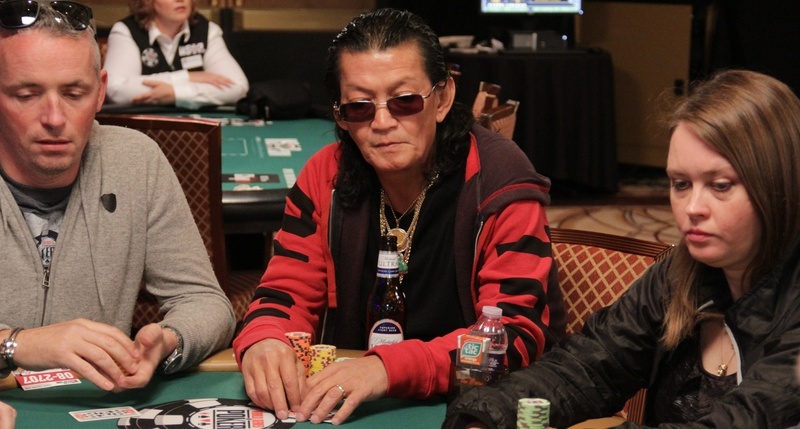 Poker Hall of Famer Scotty Nguyen, the winner of the 1998 main event, was one of 91 players to enter this year’s $50,000 buy-in Poker Players Championship. It’s an event that the 53-year-old poker pro took down in 2008 for his fifth career bracelet. Nguyen has been having a lackluster summer so far, but he nearly won a bracelet in event no. 8 ($1,500 H.O.R.S.E). He finished eighth out of 778 players in that event. His results over the past few summers demonstrate that he’s still a threat in every tournament he enters at the annual summer poker festival. Card Player caught up with Nguyen on Sunday, moments after he was eliminated from the Poker Players Championship. Brian Pempus: How are you feeling about your game this WSOP? Scotty Nguyen: You know baby, I’ve been playing so, so good and they’ve been getting lucky on me on the river. Every hand. That’s how poker runs. You are in trouble if you don’t have a little luck behind you. BP: Has a bad run of cards been something that’s easier to handle as you get older? Is it pretty easy to just move on to the next tournament? SN: Yes, that’s what I do. Next, baby. BP: How does it feel to be in the Poker Hall of Fame? Was being inducted a few years ago something that you think about often? SN: You know, you work hard for something like that. You want to get there. I put my time in and my efforts in, and they picked me for the Hall of Fame. That’s all there is to it, baby. BP: Is it weird to be at the WSOP and not see the likes of Phil Ivey and Doyle Brunson? SN: Yeah, I wonder why. It just happens. They must be getting tired to deal with 10,000-player fields. For me, it doesn’t matter how big the field is. If I feel good, I come out and play. If I don’t feel good, I stay home. It doesn’t matter if it’s 4,000 or 400 players. BP: What determines if you feel good enough to play? What goes thru your head when you wake up in the morning and you are deciding if you want to play? SN: I can tell. Your body lets you know. Do I have enough strength to deal with 10 hours of poker? If I don’t feel it, I just stay at home with my family. BP: I know you don’t play much outside the WSOP. How do you stay sharp? Do you watch poker on TV or check out new stuff that is being written about the game? SN: I never worry about that. I don’t read any books. I don’t watch any TV. You know, when I home I am just with my family. We do cooking. We go out and try to have some fun. What happened [in the Poker Players Championship] isn’t easy to swallow. You work so hard and you [almost] have them scooped, and then it doesn’t turn out like that. BP: You might get hot and win a tournament and then go on a long drought, perhaps not making another final table for years. Can you talk about how streaky the tournament game is sometimes? SN: You know, most of the [main event winners], they get lucky baby, and you don’t see them again. They get lucky, and they win big money. They really don’t need to play after scoring for $9 million. A lot of people in their lifetimes never see $1 million. Whoever wins the main event they get lucky and you don’t see them. Look, you don’t see the last six champions play the $50,000. You know what I mean? They know they can’t deal with it. I can deal with every game, baby. All I need is a little luck behind me. BP: When you look at some of the players who don’t play a lot anymore, does it make you feel good that you’ve lasted a long time in this game? SN: Yeah. I still enjoy it. You have to love the game to play it, period. BP: How many more years do you think you’ll play a bunch of events at the WSOP? Do you ever think there will be a time when you’d consider retiring? SN: Yes. You know, baby, the [Players Championship] is my main one [of the summer], and the $100,000 and the main event. All I need to do is score one of those and you would never see me fly around to play tournaments. It would just be once a year, right here. You can’t miss the World Series of Poker, baby (laughs). It is true that the luck plays an important role in the games. So luck and skill and patience made the champion.